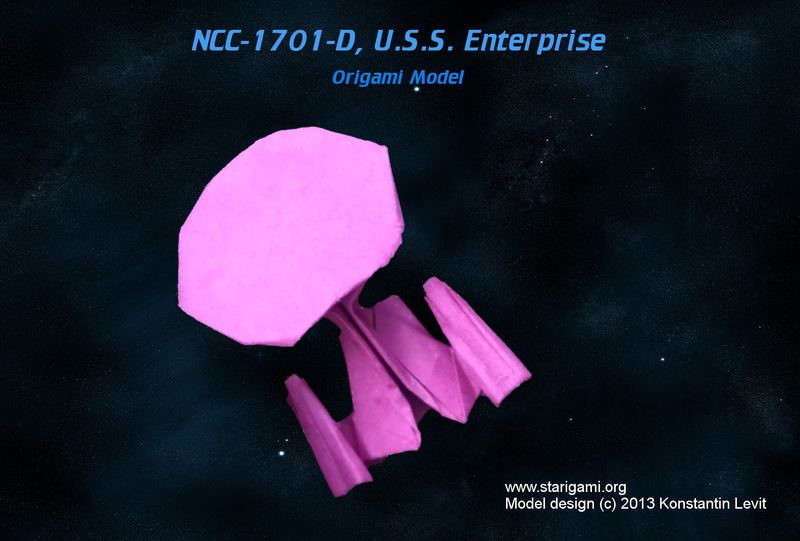 Since my first Star Trek model, I am constantly approached by friends and acquaintances who know my works to see if I could even fold Enterprise. I’ve tryied to avoid this quetion. 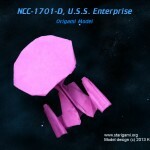 The ship is so popular that there are quite a few models of it already. 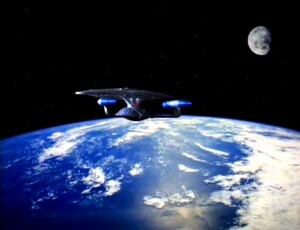 Besides I lacked the brilliant idea. 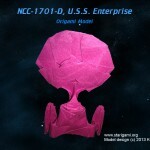 I was just not sure how I could fold from one square the saucer section, connection to the hull, the hull itself and two nacelles. I refused also to look in the instructions of existing models. Because if the solution was once spotted it will be hard to think past her to pull her out of the question and so to develop own model. After some experiments I’ve almost given up, until one evening at the Star Trek Round Table I came up with a couple of people. I’ve shown my works, exchanged ideas and suddenly, like a lightning, an idea shot through my head. 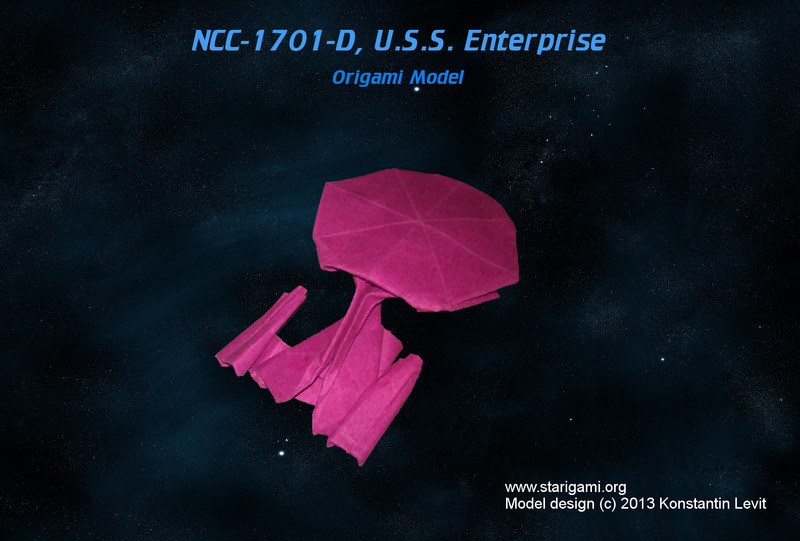 In that moment I knew, I will build first the Enterprise D with detachable saucer section. The combat section was developed rapidly in the next few days. 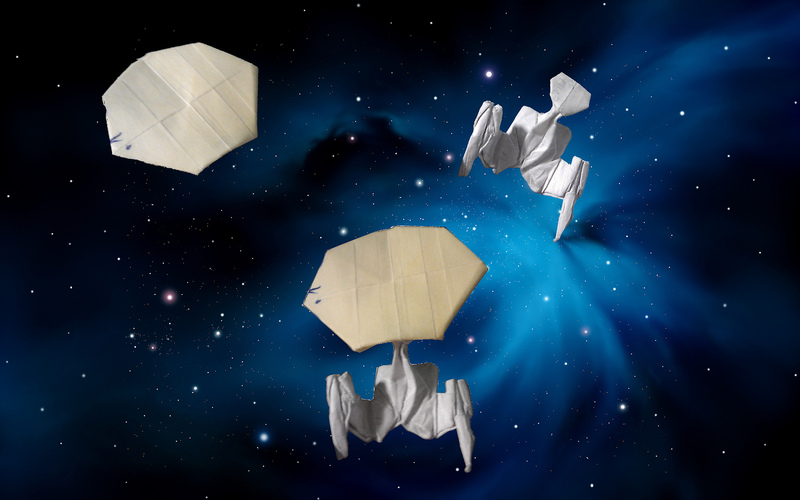 The saucer itself, which I thought was the easier part, turned out to be a problem. But after three days of development this work was also completed. The photo shows the result of this work. 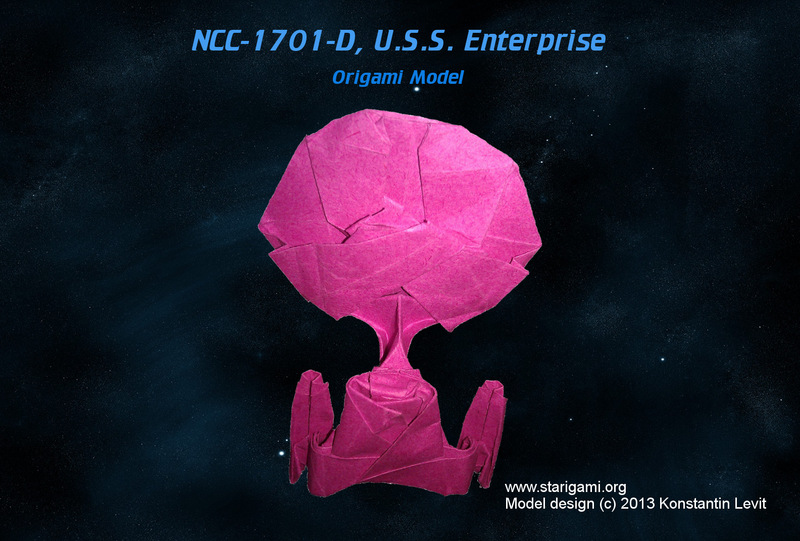 The saucer section was folded of a postit, the battle section of a reduced to a square receipts. 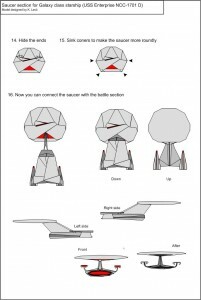 To get the right proportions the paper, which is used for the saucer section should be slightly smaller than that for the combat section. Exact proportions I do not have yet determined. These will then appear as soon in the update section. 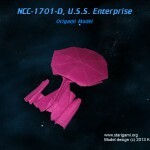 I’ve tried to make the istruction for the Enterprise D in large format. with two to three steps per page so each step could be shown very detailed. Download the instruction, try it and report if all steps were clear, with which step did you have problems, so I can improve the isnstruction for people following you. of size 20cm x 20cm so shall the saucer be folded from a square 15cm x 15cm. 20 Feb. 2013 Today I gave another look on the saucer section. 8 Mar. 2013 The little animation above was created with GIMP and is the result of ca. 20 hours of work spread over two weeks.